The “best” time for anyone to practice meditation is whenever they have the time and capacity. However, traditionally, meditation is practiced in the morning in virtually every tradition. There are reasons for this that still resonate with today’s busy lifestyle. No matter what styles of meditation you’re interested in or practice, from pairing yours with mantras from the Bhagavad Gita while counting mala beads to walking meditation while forest bathing, there’s a good chance it’s recommended that these tasks take place in the morning. In Ayurveda, the doshas rule the day. There are six timeframes that include 6 – 10 (am and pm), 10 – 2 (am and pm) and 2 – 4 (am and pm). Starting at 2 pm, the “Vata time” begins. This is the dosha that signals transition thanks to the rich magical and natural light. It’s when creativity reigns supreme and it’s recommended that peaceful environments are sought. Vata is the most sensitive of the doshas and can easily become imbalanced. If “morning” to you is before 6 am, then a meditation during the vata hours pairs well with expansive thinking. Plus, 4 am is considered the “magic hour” of writers. Kapha hour begins at 6 (am and pm). Ayurveda encourages you to wake up before this hour begins because it’s heavy and can cause sluggishness. Ayurveda also encourages practitioners to participate in an activity to get the heart pumping during this timeframe. Many meditation practitioners indulge in meditation before 6, followed by yoga or another more active task in the Kapha hour. You don’t need to follow or even believe in Ayurveda and the doshas to experience the benefits of meditation in the morning. However, it is worth noting that all meditation styles encourage a morning practice. Those that encourage an evening practice usually include it as in addition to a morning session. It gets your day started on the right note. There’s virtually no wrong way to practice, and if you’re not at risk of falling back asleep, you can even meditate before you get out of bed. Remember that meditation doesn’t need to last a long time. Even a minute or two of mindful wakefulness can be part of your practice. It forces you to slow down and create a healthy morning routine. Do you often find yourself rushing around in the morning? That kind of stress and anxiety sets the mood for the rest of the day. You’ve probably heard of healthy night routines, but don’t forget about healthy morning routines. Since meditation doesn’t have to take a long time, you won’t have to wake up much earlier to include it. It may help reduce your dependency on anxiety medication. Keep in mind that it’s never recommended to change or stop a medication without discussing it with your doctor. However, meditation is strongly linked to improving anxiety and depression. It may be a tool to help you better manage these serious disorders throughout the day. It ensures you make time for inward reflection in the day. We know we need to carve out “me time,” but that gets tougher as the day goes on. 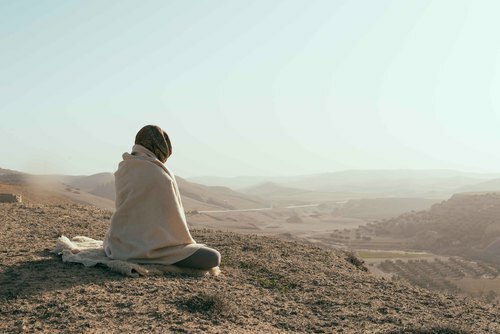 When you set aside time and space for meditation, which eases the body and mind, first thing in the morning there’s no way you’ll miss out on it. It will invigorate you in the right way. Practicing meditation won’t have you high on endorphins like a cardio session, but it improves clarity, lowers blood pressure, and will improve concentration throughout the day. Consider it a powerful tool in your arsenal for managing your day. It’s not feasible for everyone to squeeze in a 30-minute workout or hour-long yoga session in the morning. Our time is precious and some people are low on energy in the morning (which may be due to poor sleep hygiene or operating in the Kapha hour). However, everyone has time for a short meditation retreat. It’s self-care at its best, and something everyone deserves.